Hare house site: "The plantation of Richard Bate appears in the 1782 land tax. The sketch of the dwelling indicated projecting end chimneys, a central doorway, and a projecting cellar bulkhead and porch along one long side. ... Otway Hare purchased the plantation in 1837 and resided on the property with his family when the Union Army of the Potomac attacked the Petersburg defenses in June 1864. As the attack progressed, the Hare house fell behind the advancing Union lines. ... 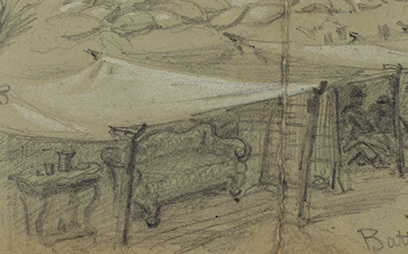 The noted Civil War illustrator Alfred Waud drew a pencil sketch of the front of the Hare house in the summer of 1864, a sketch that seems to show the effects of both shelling and pillaging. The Michler map indicates that the house stood just behind the Union siege line, between Fort Stedman and the Prince George Court House Road. 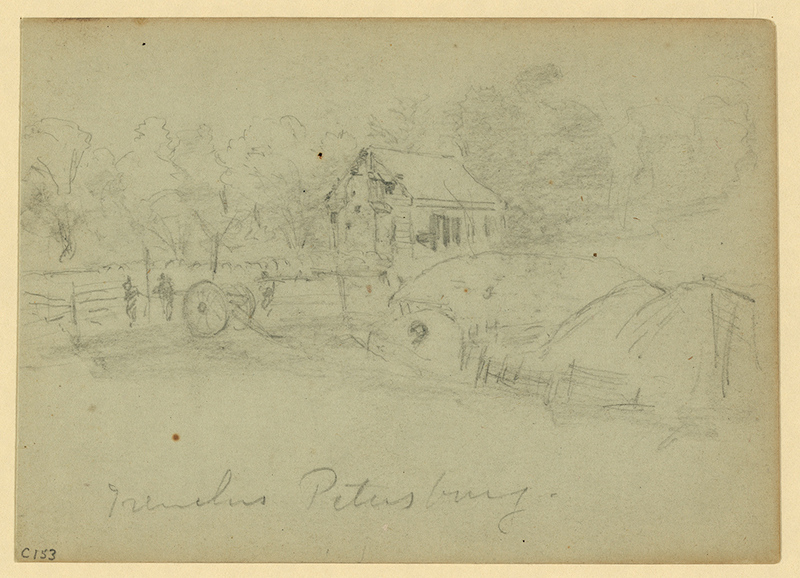 The house and adjacent buildings disappeared during the siege, probably shortly after Waud completed his sketch in the summer of 1864. Hare did not reoccupy the plantation, but resided in Petersburg after the war, where he managed a pharmacy that he had owned since 1855." -- An Archaeological Overview and Assessment of the Main Unit, Petersburg National Battlefield, Virginia, National Park Service, 2001. "On the night of the [June] 21st , the Battery withdrew from this position to go into position at the Hare House on the extreme right, and just south of which Fort Stedman was afterward built. The house was named after the proprietor of the race course. Here the men built breastworks that were only about four hundred yards from the rebel line, and hence we were in uncomfortably close quarters to the enemy. One-second fuses only could be used...... About midway between our line and the enemy's, stood a barn. It had nearly all been taken down to the main floor, and on this floor lay about eighty bushels of corn" (Roemer 221). 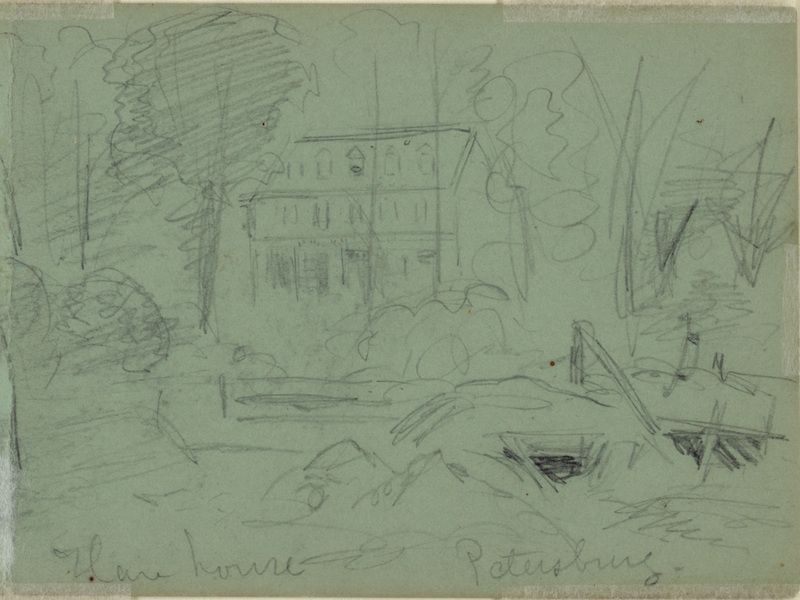 "Hare House, Petersburg, June 1864" drawing by Alfred R. Waud, LC Waud, no. 909 verso (21606). Roughed in sketch for the finished drawing below. "…I have two regiments of sharpshooters at work to keep them [the Confederates] down. From the cellar to the garret of the Hare House they are firing at the enemy. The reason the enemy can’t shell the house is because these men keep them from loading their guns. Also we have our guns and mortars to play on them...."
-- Civil War Letters of General Robert McAllister, edited by James I. Robertson, Jr., Louisiana State University Press, 1998, p 447. "On the 19th Companies E and G occupied a position in and around the house, the brigade building a line of works across the garden. Hare's house was evidently left by the late occupants in a hurry, as a large amount of books and papers principally referring to sporting items, furniture of different kinds, carpets, etc., were found scattered about. The walls of the building were completely perforated with bullet holes, while larger ones were being daily made by round shot and shell. The windows of the carpeted basement opened on one side in full view of the rebel pits in front, and as the basement itself made a very comfortable rifle pit, with chairs of mahogany to sit on, a number of the riflemen took possession of the same for the day. Among them was Emery Munsell, who was seated in an arm-chair with his 28-pounder, making long-range shots, several of which were thrown at random towards Petersburg, in hopes of attracting the notice of the editor of the [Petersburg] Express while seated in his evidently uneasy chair, where he could have found a truthful item about the Sharpshooters, as an equivalent to the lying one he invented on the death of Durkee before Yorktown; as the Union Sharpshooters were actually established in a "carpeted rifle pit" (but furnished by the enemy) with "comfortable arm-chairs to sit in," and "mahogany tables to eat off of;" although the wine cellar which was close at hand, contained naught but empty bottles. "While the New Hampshire captain (Andrews), and Wisconsin lieutenant (Stevens), were seated at one of Hare's tables at half past six o'clock the morning of the 19th, eating their simple breakfast of hard-tack and coffee, the rebel bullets whizzed through the windows over their heads into the opposite wall, showing conclusively that they had range of the place although they did no harm, yet succeeded in raising considerable dust inside as the broken plaster fell to the floor. The Sharpshooting party, however, silenced them in the course of the morning." -- Capt. C. A. Stevens, Berdan’s United States Sharpshooters in the Army of the Potomac, 1861-1865 (St. Paul, MN: The Price-McGill Company, 1892), 456-58. Fun in the Hare House. Many of the men occupied the Hare house. In the parlor was a piano which was played by the boys to the accompaniment of the music of cannon and musketry. Some donned women's clothing found in the closets and made merry, dancing a cotillion as shells tore through the roof and bullets broke the glass in the windows. One boy was struck in the face by a minie ball while he sat in a rocking chair, just after he had said: "What do you think the folks at home would say to this?" N. P. Cutler wrote in greater detail this story for the Boston Journal of Jan. 24, 1893 (p.288). 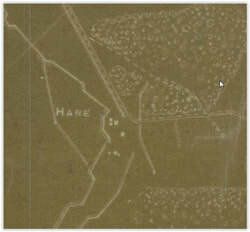 This Federal map from early in the siege depicts multiple buildings at the Otway Hare estate. NARA RG 77.